Where were you when you heard that song? Where were you when you fell in love? Where were you when you felt you knew who you were? These are questions that writer/director John Carney asks in his new musical joint, Sing Street. In your teenage years there's perhaps no greater influence than music to help you find yourself. It's that feeling of someone articulating something you've felt but never been able to understand or tell someone else. Carney, director of Once (2007) and Begin Again (2014), has soared past his previous efforts and bottled up that feeling of music composing one's identity in a tale of teen romance. Set in 1985 Dublin, a quiet teenage boy named Conor (Ferdia Walsh-Peelo) is forced to leave his private school and enter a tough public school. The music video has just emerged and his brother Brendan (Jack Reynor) indoctrinates him into the musical world of the mid 80's. Conor watches Duran Duran as though he's just encountered a higher being. His musical calling gives him the courage to ask a slightly older girl named Raphina (played incredibly by Lucy Boynton) if she'll be in his music video. She agrees and now all he has to do is actually form a band. He also doesn't know much about music but Brendan is the Obi-Wan of 80's music and guides him to his sonic destiny. Conor's musical awakening is paralleled by the formation of his band as well as his relationship with Raphina and his brother. In Sing Street, music is the "force," a guiding entity articulating what characters want to but cannot say. The film plays with coming of age tropes and while it does have a road map structure akin to a John Hughes film, there are multiple spinning side plots deserving of their own movie. Most of the band members have their own tough family life that they're running away from. Adults with broken lives act as warnings that the future may not end up as desired. At one point amidst the music video mayhem Brendan stops to look out at his mother sitting alone and drinking wine. To Conor he says, "I often wonder what she's thinking about." There's dark stuff lurking beneath the wide-eyed optimism, which is what gives the film a weight and emotional impact that most coming of age films only dream of. Sing Street has a dense world but Carney sets the focus on Conor and Raphina's relationship. Films about young boys growing up often leave the girl as a projection of his own desires, but Raphina is a fully rounded character with her own vulnerabilities and wants. Raphina speaks of her destiny to go to London and become a model. She hides herself behind extravagant clothes and makeup. The entire cast is solid but Lucy Boynton is the rock star. The film bursts with energetic camera movements in it's musically driven scenes, and while this is sometimes too much, Carney smartly slows down with tracking shots for Conor and Raphina's life chats. I was reminded of Before Sunrise and fell completely into their relationship. It’s a rush of euphoria with a lingering sadness that it may not last. Carney stylizes his film with the excesses of 80's music video aesthetic: hair bands, David Bowie makeup, blazers, bright colors, crazy camera movements. Conor rounds up his band of misfits and they run around filming music videos with the delirious optimism of a group of freshman film students. Conor's songs come from a place of earnestness and he describes himself as a "futurist," but for us they're guides to understanding and remembering our younger self. But this isn't a nostalgic film. In fact, Sing Street is a film obsessed with the future. Throughout Conor sees visions of what he wants that also articulate his fears. Carney transitions into the visions with ease. At one point a full on dance number pays homage to Back to the Future and Rebel Without a Cause. I almost got up and started applauding. If Carney is drawing from classic coming of age films he's filling in the lines with as much depth and personality as he can summon. Somewhere in the latter half it covertly detours into an insightful poem on passion and sacrifice that go beyond on just Conor and Raphina. Conor's relationship with Brendan starts at a place of comedy and slowly turns into a heartfelt sacrifice from an older brother whose life has passed him and simply wants for his younger brother to not let go of his passion. 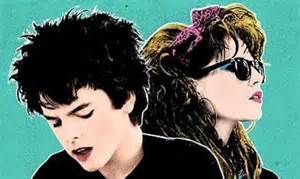 John Carney's musical coming of age tale might just be a modern classic. I wonder if it’s plotting is a bit too familiar to reach all time status but Carney’s specificity may allow it to at least knock on the door. 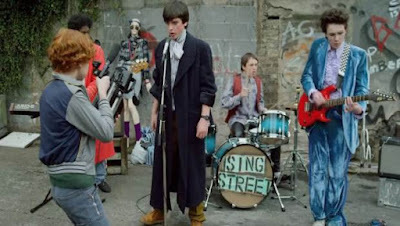 Sing Street is enjoyable just for it's fantastic music (original and classic), addictive teenage energy and cast, but it's personal understanding of sacrifice, young love, and loss pushes it into rare territory. Think again back to that song that made you feel like you really knew who you were. Sing Street takes us back to that song and then asks us to hit play on the next track.